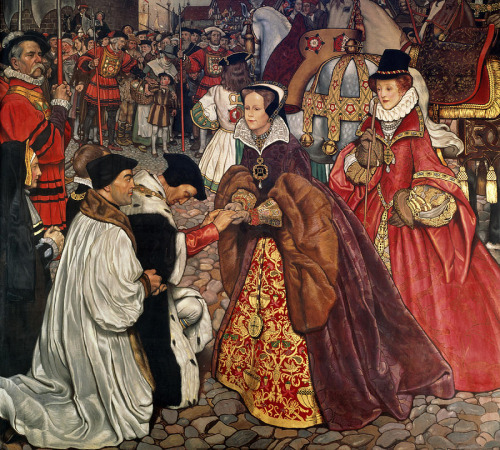 On this day in 1553 – Queen Mary I rode into London with Elizabeth. On 3rd August 1553 Queen Mary I rode into London after being proclaimed Queen, she rode alongside her Elizabeth, her half sister. They travelled from Wanstead to Aldgate where Mary was greeted by the Lord Mayor of London who handed her ‘the scepter perteyninge to the office’ Mary handed the sceptre back to the Lord Mayor and entered the city followed by Sir Anthony Browne, the Duchess of Norfolk, Marquess of Exeter and in front of Mary travelled the Lord Major with the sceptre and the Earl of Arundel holding the sword of state. The party passed St Botolph’s Church where the children of the local Christ’s hospital greeted the new Queen and they passed through Leadenhall towards Gracechurch Street and Fenchurch Street then down Mark Lane before arriving at the Tower of London. It was at the Tower that Mary was met by Sir John Gage, the Constable of the Tower and Thomas Bruges who welcomed the Queen into the Tower. Inside the Tower Mary was also greeted by the Duke of Norfolk, Bishop Gardiner and Edward Courtenay. Mary’s arrival in London marks the start of her reign as Queen. Sir Thomas More was sentenced to be executed on 6th July 1535 after being found guilty of treason. On his last day he wrote one final letter to his daughter, Margaret Roper from the Tower of London. It was written in charcoal onto cloth after he had previously had all writing instruments taken away from him. “Our Lord bless you good daughter and your good husband and your little boy and all yours and all my children and all my godchildren and all our friends. Recommend me when you may to my good daughter Cecilye, whom I beseech our Lord to comfort, and I send her my blessing and to all her children and pray her to pray for me. I send her an handekercher and God comfort my good son her husband. My good daughter Daunce hath the picture in parchment that you delivered me from my Lady Coniers; her name is on the back side. Show her that I heartily pray her that you may send it in my name again for a token from me to pray for me. I like special well Dorothy Coly, I pray you be good unto her. I would wit whether this be she that you wrote me of. If not I pray you be good to the other as you may in her affliction and to my good daughter Joan Aleyn to give her I pray you some kind answer, for she sued hither to me this day to pray you be good to her. I cumber you good Margaret much, but I would be sorry, if it should be any longer than tomorrow, for it is Saint Thomas even, and the Vtas of Saint Peter and therefore tomorrow long I to go to God, it were a day very meet and convenient for me. I never liked your manner toward me better than when you kissed me last for I love when daughterly love and dear charity hath no leisure to look to worldly courtesy. I send now unto my good daughter Clement her algorism stone and I send her and my good son and all hers God’s blessing and mine. 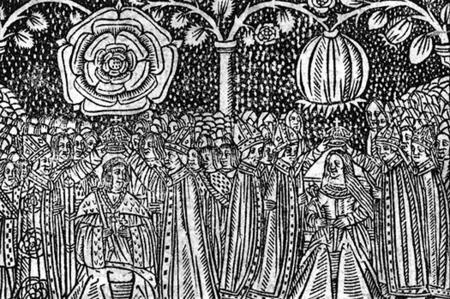 24th June 1509 saw Henry Tudor and his new wife Katherine of Aragon crowned as the new king and queen of England, making Henry King Henry VIII. On Saturday 23rd June at 4pm a procession began that would take Henry from the Tower of London to Westminster. It was led by the newly created Knights of the Bath who were dressed in blue gowns. They were followed by the newly created Constable of England, Edward Stafford, Duke of Buckingham. Buckingham was carrying a silver baton that showed his office and he was then followed by the soon to be King. The streets were lined with tapestries and cloths of gold. Henry wore a cloth of gold coat that was highly decorated with gems and a collar of rubies and topped with a collar of red velvet and ermine trimmed robe. Henry’s horse was also dressed for the procession in ermine and cloth of gold. There was also a cloth of gold canopy held over him by the four barons of Cinque Ports. Behind Henry came his master of the horse, Sir Thomas Brandon. Following Brandon came the procession for the future Queen. Katherine was escorted in a litter covered by a canopy. Katherine wore her hair loose, which was custom for a coronation procession and was dressed in ‘a rich mantle of cloth of tissue’ and a gold, pearl and silk circlet upon her head. On 24th June at 8am following behind 28 bishops Henry and Katherine proceeded from the Palace of Westminster towards the Abbey for the ceremony. It was performed by the Archbishop of Canterbury, William Warham. Warham presented Henry to the crowd and called ‘Vivat ,vivat rex’ translated into English as ‘Long live the King’. Henry went on to swear the nine oaths of kingship and was anointed by Warham with the holy oils before being crowned. Katherine was then crowned Queen and the couple moved back to Westminster Hall for a splendid celebration banquet. “The following day being a Sunday, and also Midsummer’s Day, the noble prince with his queen left the palace for Westminster Abbey at the appointed hour. The barons of the Cinq Ports held canopies over the royal couple who trod on striped cloth of ray, which was immediately cut up by the crowd when they had entered the abbey. Inside, according to sacred tradition and ancient custom, his grace and the queen were anointed and crowned by the archbishop of Canterbury in the presence of other prelates of the realm and the nobility and a large number of civic dignitaries. The people were asked if they would take this most noble prince as their king and obey him. With great reverence, love and willingness they responded with the cry ‘Yea, Yea’. 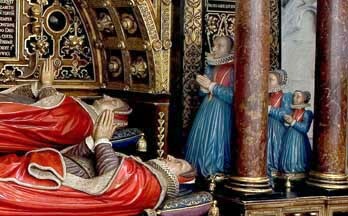 When the ceremony was finished, the lords spiritual and temporal paid homage to the king and, with the queen’s permission, returned to Westminster Hall – each one beneath his canopy – where the lord marshal bearing his staff of office ushered all to their seats. Each noble and lord proceeded to his allotted place arranged earlier according to seniority. The nine-piece table being set with the king’s estate seated on the right and the queen’s estate on the left, the first course of the banquet was announced with a fanfare. At the sound the duke of Buckingham entered riding a huge charger covered with richly embroidered trappings, together with the lord steward mounted on a horse decked with cloth of gold. The two of them led in the banquet which was truly sumptuous, and as well as a great number of delicacies also included unusual heraldic devices and mottoes. Hall goes on to describe the events of the days that followed that included two days of jousting and even more banquets. “The following day the aforementioned defending team, lady Palla’s scholars, presented themselves before the king ready for the tourney. All on horseback and armed from head to foot they each had one side of their armour-skirts and horse-trappings made of white velvet embroidered with gold roses and other devices, and the other made of green velvet embroidered with gold pomegranates. On their headpieces each wore a plume of gold damask. At the same time the other side rode in, the aforementioned eight knights fully armed and dressed, like their mounts, in green satin embroidered with fine golden bramble branches. Following them, blowing horns, came a number of men dressed as foresters or gamekeepers in green cloth, with caps and hose to match, who arranged a set like a park with white and green fencing around it. Inside this paddock were fallow deer and artificial trees; bushes, ferns, and so forth. Once set up before the queen the paddock gates were unlocked and the deer ran out into the palace grounds. Greyhounds were then let loose which killed the deer, the bodies of which were then presented to the queen and then assembled ladies by the above-mentioned knights. Crocheman, who had brought in the golden lance the previous day, then declared that his knights were the servants of the goddess Diana and whilst they had been indulged in their pastime of hunting had received news that lady Pallas’s knights had come into these parts to perform feats of arms. Thereupon they had left off the chase and come hither to encounter these knights and to fight with them for the love of the ladies. He added that if lady Pallas’s knights vanquished them or forced them to leave the field of battle then they would receive the deer that had been killed and the greyhounds that slew them. But if Diana’s knights overpowers their opponents they were to be given the swords of those knights and nothing more. Hearing this, the queen and her ladies asked the king for his advice on the matter. The king, thinking that perhaps there was some grudge between the two parties and believing that to grant the request might lead to some unpleasantness, decided not to consent to the terms. Instead, to defuse the situation, it was decided that both parties should fight the tourney but that only a limited number of strokes would be permitted. On this day in 1585 – Henry Percy, 8th Earl of Northumberland died. Henry Percy, 8th Earl of Northumberland was born in 1532 at Newburn Manor, he was the second son of Sir Thomas Percy and his wife Eleanor Harbottle. Percy and his brother, Thomas, were brought up in Northumberland and therefore were close to the Scottish borders and were likely to have witnessed battles between the English and Scottish. During the reign of Queen Mary I Henry Percy was appointed governor of Tynemouth Castle, where in his later life Percy’s wife would give birth to their son, also Henry, here in 1564. Percy was also a Member of Parliament for Morpeth in 1554, knighted in 1557 and was also appointed as deputy warden of the east and middle marches. With the accession of Queen Elizabeth I Percy was kept in his chief offices with the excpetion of having to transfer his governship of Tynemouth Castle in order to become captain of Norham Castle. However, he was reappointed back to Tynemouth in 1561. With war against Scotland breaking out in 1560 Percy was given command of a body of light horse and led a troop in battle. With the French defeat at Leith, the commander of the French army D’Oyzelle asked if he could surrender his sword to Percy and not the commander-in-chief, Lord Grey. Percy was commissioned in 1561 along with the Thomas Young, Archbishop of York, to administer the Oath of Supremacy to the clergy in the north. Percy’s position in the north was strengthened at the end of the year when he married Catherine Neville, daughter and co-heiress of John Neville, 4th Baron Latimer, they went on to have 11 children. After his marriage he was appointed Sheriff of Northumberland in 1562. In late 1569 the Rising of the North occurred in which Henry Percy’s elder brother, Thomas was a chief leader. Henry Percy however, remained loyal to the Queen and the government and he joined the royal army in the fight against the rebels. With his brother captured and imprisoned in Scotland Percy wrote to him to urge him to confess his guilt and appeal to the Queen’s mercy. Instead Thomas Percy was executed in York in 1572. Henry Percy was awarded the title of Earl of Northumberland. However, Percy was not as loyal as he seemed. On 15th November 1571 he was arrested and sent to the Tower of London. He had been found communicating with John Lesley, bishop of Ross, offering his help to free Mary, Queen of Scots from Tutbury. On 23rd February 1572 Percy wrote to the Queen begging to be released, however, he was left in the Tower for the next 18 months until he was brought to trial charged with treason. Once again begging the Queen’s mercy he was fined 5000 marks and ordered to remain under house arrest at his home at Petworth. It wasn’t until 12th July 1573 when he was summoned to London and given his freedom. On 8th February 1576 he took his seat in the House of Lords for the first time and he was appointed as one of the royal commissioners to prorogue parliament in November. In 1582, Percy was once again brought into the plots surrounding Mary, Queen of Scots when he met with M.de Bex, a French agent, and looked at Throckmorton’s plot to free the Scottish Queen. He was once again arrested along with Lord Henry Howard and Francis Throckmorton. Percy was sent to the Tower again, unlike his previous stay he was only here for a few weeks and was not charged although he was stripped of his governship of Tynemouth Castle. Once released Percy was still keen to release Mary and the following September he met Charles Paget and his brother at his home, Petworth to discuss the matter fully. Percy offered advice as to where the French troops could land to launch their rescue mission. One of Percy’s aides was also present at this meeting, William Shelley. Shelley was arrested and tortured and confessed all about Percy’s meeting but claimed that it was Percy’s mission to not only rescue Mary but to also extort from the Queen full toleration towards Roman Catholics. Henry Percy found himself, for a third time, in the Tower of London where he continued to protest his innocence and beg for the Queen’s mercy. On 20th June 1585 six months after being imprisoned Percy was found dead in his cell. He had been shot through the heart, it was declared. Percy’s death has always been suspicious the day before his death he was placed under the care of a new warden by the Lieutenant of the Tower on orders of Sir Christopher Hatton. Rumours spread that Hatton was responsible for Percy’s death and many years later Sir Walter Raleigh wrote to Sir Robert Cecil referring the Hatton’s guilt. 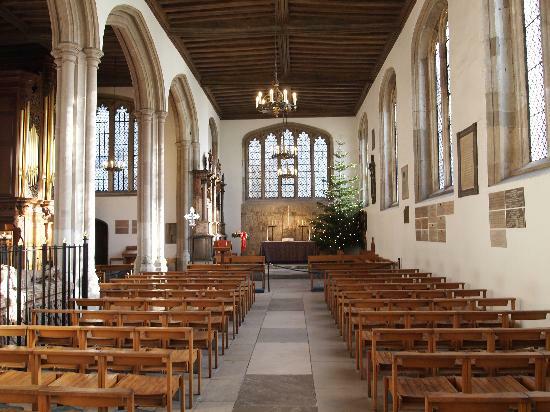 Percy was buried in the church of St. Peter ad Vincula within the grounds of the Tower of London. “Prostate at your Majesty’s feet, I have heard your pleasure by your Controller, viz., that I should write such things as I thought meet concerning my most miserable state. And where I have been accused of treason, I never in all my life thought to displease your Majesty; much less to do or say “that thing which of itself is so high and abominable offence.” Your Grace knows my accusers, God forgive them. If it were in my power to make you live for ever, God knows I would; or to make you so rich that you should enrich all men, or so powerful that all the world should obey you. For your Majesty has been most bountiful to me, and more like a father than a master. I ask you mercy where I have offended. Never spoke with the Chancellor of the Augmentations and Frogmerton together at a time; but if I did, I never spoke of any such matter. Your Grace knows what manner of man Throgmerton has ever been towards you and your proceedings. What Master Chancellor has been to me, God and he know best; what I have been to him your Majesty knows. If I had obeyed your often most gracious counsels it would not have been with me as now it is. But I have committed my soul to God, my body and goods to your pleasure. As for the Commonwealth, I have done my best, and no one can justly accuse me of having done wrong wilfully. If I heard of any combinations or offenders against the laws, I have for the most part (though not as I should have done) revealed and caused them to be punished. But I have meddled in so many matters, I cannot answer all. The Controller showed me that you complained that within these 14 days I had revealed a matter of great secrecy. I remember the matter, but I never revealed it. After your Grace had spoken to me in your chamber of the things you misliked in the Queen, I told you she often desired to speak with me, but I durst not, and you thought I might do much good by going to her and telling her my mind. Lacking opportunity I spoke with her lord Chamberlain, for which I ask your mercy, to induce her to behave pleasantly towards you. I repeated the suggestion when the lord Chamberlain and others of her council came to me at Westminster for licence for the departure of the strange maidens. This was before your Grace committed the secret matter to me, which I never disclosed to any but my lord Admiral, by your commandment on Sunday last; whom I found equally willing to seek a remedy for your comfort, saying he would spend the best blood in his belly for that object. Anne de Vere nee Cecil, was born on 5th December 1556 to William Cecil, 1st Baron Burghley and his wife Mildred Cooke. Anne would grow up to be well educated and was well versed in French, Latin and potentially Italian, she was tutored by William Lewin. It is no surprise that Anne was a woman of many languages when her mother was well noted from her translations from the Greek. In 1569 Anne was engaged to Sir Philip Sidney but the marriage negotiations failed and instead she married Edward de Vere, 17th Earl of Oxford on 19th December 1571 at Westminster Abbey. Edward was the ward of William Cecil and so the two grew up in the same household. Following the marriage Anne continued living at home and son fell pregnant and on 2nd July 1575 she gave birth to a daughter, Elizabeth. Edward was abroad touring Europe and upon his return accused Anne of adultery and declared the child illegitimate. In April 1576 he officially separated from Anne and refused to recognise her at court. During the separation in 1581 Edward was imprisoned in the Tower of London at the Queen’s command for having an illegitimate child with one of her Lady’s of the Bedchamber. 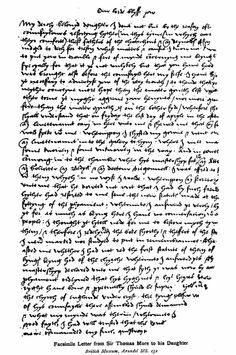 Edward was quickly released and in December 1581 Anne had begun corresponding with her husband once more and they reconciled the following month, with Edward accepting that Anne’s daughter was his. With the marriage reconciled the de Vere’s went on to have a further four children taking the total to five, four girls and a boy. Unfortunately Lord Bulbecke died in his early infancy. It was believed that Anne wrote a handful of poems about her son that were published in Pandora (1584), however these are potentially written by someone else using her viewpoint. Anne died on 5th June 1588 at the age of 31 from unknown causes. She is buried at Westminster Abbey where her mother and daughters were later buried.